Tambabox is an object-space created from the extraordinarily varied and complex world of industrial textiles that most of the Senegalese use to make their own boubous. The project consists of the creation of an inner space enveloped by an assembly of textile canvasses. The textiles that delimit this architecture are murals in which the body is partly transformed, becoming part of the linen cloth: complex fragments that describe the variety of the landscape and its people, towns that coexist in their markets, their cities, or their vast and wide horizon. Tambabox emerges from the landscape looking for an almost impossible intimate place; it defines a new place, contrasting with the concept of construction and landscape of the surroundings related to open spaces of ample horizons. The piece works like a structure interposed between the sunlight and the interior space it encloses. 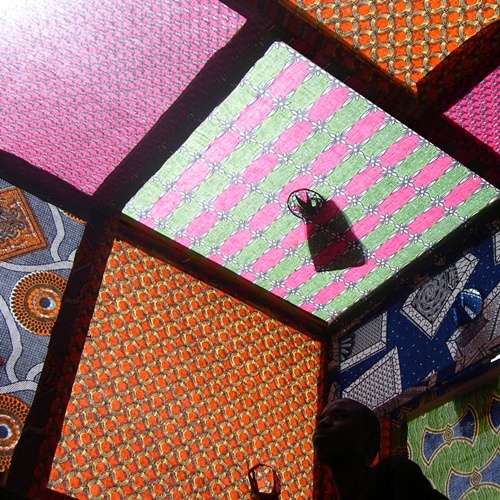 The textile planes are regulators of light, filters that sift natural light from the outside. During the day, lighting in the space varies through different reflections and colourations, with light figures developing through the fading backgrounds. At night the space is transformed into an illuminated polychromatic box, contrasting with the intense darkness. From the textile canvas, projected shadows of bodies are revealed from the interior. The space is a static piece which, in contact with the body, becomes an animated object as a provocation transmitted by the skin. The result is a space where sculpture, architecture and movement come together – a project that explores the space through the corporal experience of the people – and has the capability to fragment into multiple pieces that disperse through the walls of the city. The project was realized in collaboration with local craftsmen, carpenters and tailors – fundamental characters of great tradition in Senegal. It was proposed as an open space where different art disciplines – dancers, musicians, actors and painters – could take part in the same poetry.